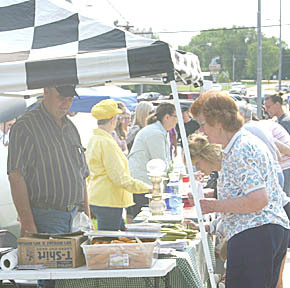 There was a good turnout for Albion’s first Country Market was held north of the courthouse on Church Street last Saturday, June 4. The event was a success, with six vendors and many customers. Little garden produce was available due to spring weather conditions, but vendors sold a range of items from baked goods to crafts, and meats and cheeses to farm fresh eggs. The farmers’ market will continue through the season at this location. For information, contact Lori Krohn, 402-395-2666 or 402-395-6203.